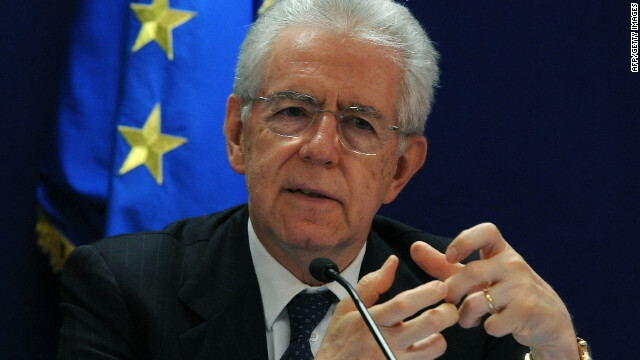 (File photo) Italian Prime Minister Mario Monti speaks in Brussels early May 24 2012. 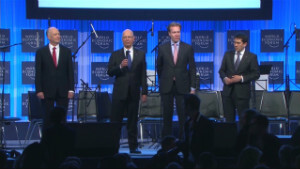 Monti also told Davos delegates the EU "does not need unwilling Europeans"
Davos, Switzerland (CNN) -- Italian Prime Minister Mario Monti said he was confident the UK would stay in the European Union, despite Prime Minister David Cameron's promise to hold a referendum on the topic. "I am confident if there is to be a referendum, the UK citizens will decide to stay in the EU and continue to shape its future," Monti said during his special address at the World Economic Forum in Davos Wednesday. "The EU does not need unwilling Europeans -- we desperately need willing Europeans," he said, noting a referendum would crystallize the issue. Monti said he was pushing to speed up the completion of the single market, which had lost pace after a successful launch 20 years ago. "On this I agree with Prime Minister Cameron...that prosperity and growth be priority number one for Europe," he said. Monti also used his speech to criticize the country's financial record under predecessor Silvio Berlusconi. "Italy in the past did not use the opportunities of the past to do reforms," Monti said. Should Britain stay in the EU? What would the impact be if it left? Send us your thoughts. The country wasted its surplus and "lived under the illusion we could offer change without reforms," he added. "This is what one can call promising reforms, and ending up with taxes and debt and a sovereign debt crisis." The government chose "the policy of status quo and procrastination," he said, and "the costs of inaction were dumped were dumped on our children and grandchildren until the moment of truth." Monti's comments come as the union's relationships suffer the strain of nearly three years of crisis with the euro, the common currency to which 17 of the 27 EU nations belong. Monti blamed "short-termism" for Italy's financial problems, which pushed the country's cost of borrowing above the crucial 7% level a year ago and put it in the center of the crisis. Monti is a technocrat leader appointed by President Giorgio Napolitano after the soaring borrowing costs -- and Berlusconi's colorful private life and tax scandals -- toppled the long-term leader. Berlusconi pulled his support for Monti's government late last year, triggering elections due in February. Monti implemented tough austerity measures and said his actions had pulled the country through the crisis, although more needed to be done. "Today, the atmosphere around Italy has changed... I can feel Italy has gained back respect and confidence and respect for its ability to bounce back," he said. "I think this change is a reward for the action taken by my government with the support of the parliament, most of all it must be a reward for all Italian citizens." Monti said the "resilience and maturity" of the Italian people had helped the country emerge from crisis. "More, much more needs to be done for sure, but the progress is not negligible." 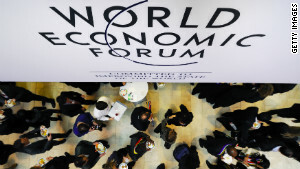 Global policymakers, leading thinkers and key entrepreneurs are gathering in Davos. CNN brings you the latest news, views and musings live. Free trade, transparency and a crackdown on tax cheats will be at the heart of Britain's G8 presidency, Prime Minister David Cameron told the World Economic Forum in Davos. 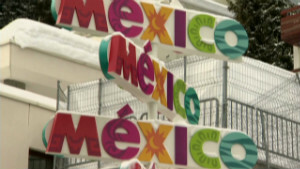 Walk the halls of Davos and you're bound to bump into celebrities, heads of state and even princes and princesses. The mayor of London says a controversial vote for the British people whether to stay in the European Union is all part of democracy. A top European Union official says there's no need for Britain to make threats to leave the union in order to reform its membership. Kenyan Prime Minister Raila Odinga says his country will not negotiate with al Qaeda-linked Somali militants who have threatened to kill Kenyan hostages unless Nairobi releases all Muslims charged with terrorism. LeWeb founder Loic Le Meur is looking to "digital hippies" as a potential theme for his next conference. The head of Airbus says the European aviation giant will take care to learn from its own mistakes -- and rival Boeing's -- ahead of the launch of its new widebody A350 aircraft. Can this be a game-changer on climate? As extreme weather events cost the global economy billions each year, the "neglected" risk of climate change seems to be rising to the top of the agenda, Andrew Steer writes. Economic empowerment offers a win-win scenario for Saudi Arabia and its women, Mounira Jamjoon writes. The recession in Europe is entering its fifth year and unemployment doesn't look like it will be returning to normal levels anytime soon. What has been made clear by current events and financial upheavals since 2008 is that the global economy has become truly that -- global. On July 1, 2013 the 27-nation European Union will become 28. But is the Adriatic country ready to join Europe's elite club?